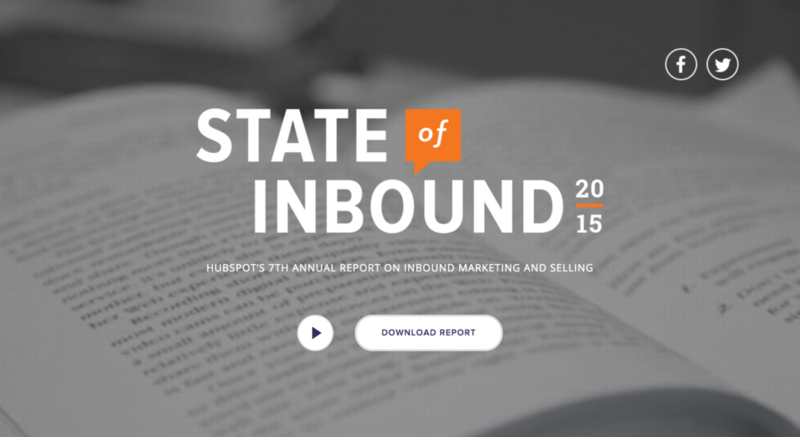 In October, Hubspot released it's annual State of Inbound report for 2015. Hubspot is a Boston-based technology company that builds software to make marketing way easier, from building web pages to sending emails, their tools help you better create and track marketing efforts. As we head into 2016, this valuable information could give you some insight that will help you take your business to the next level in the new year. If you aren't too sure about what inbound marketing is or how it differs from outbound marketing, be sure and read the 'Inbound vs Outbound' section of my marketing buzzwords blog post. According to Hubspot, 3 out of 4 marketers across the globe use inbound marketing tactics. I'll say it again, don't be turned off by the term 'marketer.' If you run your own business, marketing is a part of that. And from what Hubspot's report shows, you should be using inbound strategies. This spans all industries and verticals, whether you're selling to consumers, businesses, or even operate a nonprofit! Inbound is cheaper, effective, and you can find plenty of resources to get you started (I'd start by browsing Hubspot's Marketing Resource Library). Inbound AND outbound marketers consider paid advertising as an overrated tactic. Note that 'overrated' doesn't necessarily mean ineffective, but I would beef up your content (such as blogs and social media) before investing money in paid ads. At larger companies, ROI (return on investment) is typically how marketing teams prove their value. It matters just as much, if not more, for smaller companies with smaller budgets. Dollar for dollar, inbound activities will generate more money for your business. A large reason for this is due to not only how effective inbound activities are, but to the face that many of them are cheap or even free! Blogs are a great place to start, they provide valuable content to your readers and help improve your website's SEO. These three takeaways are things that everyone should be implementing in their company's marketing strategy, whether you're a one person show or a Fortune 500 company. For the full report visit: www.stateofinbound.com.